The vagus nerve is the 10th cranial nerve (CN X). It is a functionally diverse nerve, offering many different modalities of innervation. It is associated with the derivatives of the fourth and sixth pharyngeal arches. In this article, we shall look at the anatomy of the vagus nerve – its anatomical course, functions and clinical correlations. Sensory: Innervates the skin of the external acoustic meatus and the internal surfaces of the laryngopharynx and larynx. 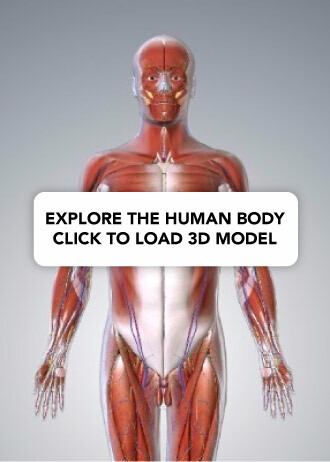 Provides visceral sensation to the heart and abdominal viscera. Special Sensory: Provides taste sensation to the epiglottis and root of the tongue. Motor: Provides motor innervation to the majority of the muscles of the pharynx, soft palate and larynx. Parasympathetic: Innervates the smooth muscle of the trachea, bronchi and gastro-intestinal tract and regulates heart rhythm. The vagus nerve has the longest course of all the cranial nerves, extending from the head to the abdomen. Its name is derived from the Latin ‘vagary’ – meaning wandering. It is sometimes referred to as the wandering nerve. The vagus nerve originates from the medulla of the brainstem. It exits the cranium via the jugular foramen, with the glossopharyngeal and accessory nerves (CN IX and XI respectively). Within the cranium, the auricular branch arises. This supplies sensation to the posterior part of the external auditory canal and external ear. The right vagus nerve passes anterior to the subclavian artery and posterior to the sternoclavicular joint, entering the thorax. The left vagus nerve passes inferiorly between the left common carotid and left subclavian arteries, posterior to the sternoclavicular joint, entering the thorax. Pharyngeal branches – Provides motor innervation to the majority of the muscles of the pharynx and soft palate. Superior laryngeal nerve – Splits into internal and external branches. The external laryngeal nerve innervates the cricothyroid muscle of the larynx. The internal laryngeal provides sensory innervation to the laryngopharynx and superior part of the larynx. Recurrent laryngeal nerve (right side only) – Hooks underneath the right subclavian artery, then ascends towards to the larynx. It innervates the majority of the intrinsic muscles of the larynx. In the thorax, the right vagus nerve forms the posterior vagal trunk, and the left forms the anterior vagal trunk. Branches from the vagal trunks contribute to the formation of the oesophageal plexus, which innervates the smooth muscle of the oesophagus. 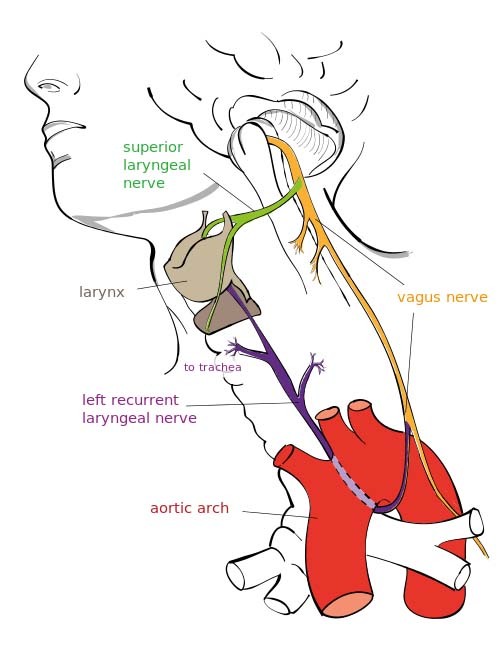 Left recurrent laryngeal nerve – it hooks under the arch of the aorta, ascending to innervate the majority of the intrinsic muscles of the larynx. Cardiac branches – these innervate regulate heart rate and provide visceral sensation to the organ. The vagal trunks enter the abdomen via the oesophageal hiatus, an opening in the diaphragm. In the abdomen, the vagal trunks terminate by dividing into branches that supply the oesophagus, stomach and the small and large bowel (up to the splenic flexure). There are somatic and visceral components to the sensory function of the vagus nerve. Somatic refers to sensation from the skin and muscles. This is provided by the auricular nerve, which innervates the skin of the posterior part of the external auditory canal and external ear. Laryngopharynx – via the internal laryngeal nerve. 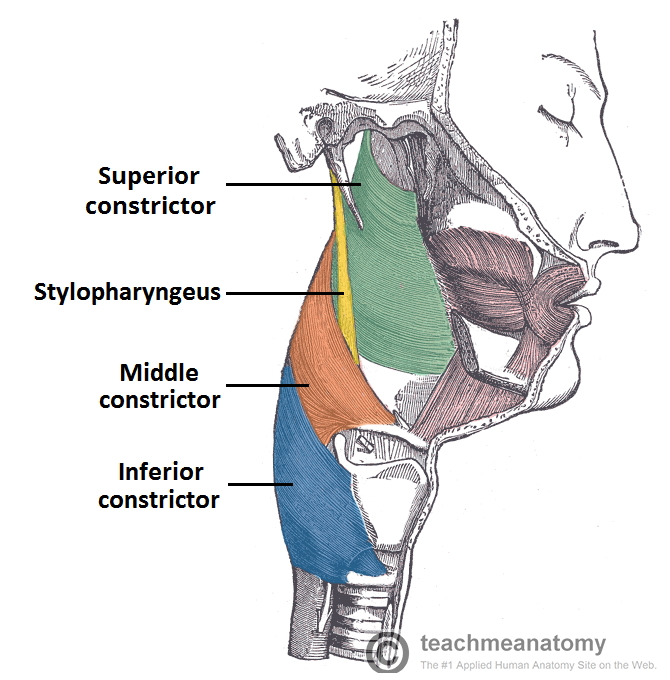 Superior aspect of larynx (above vocal folds) – via the internal laryngeal nerve. Heart – via cardiac branches of the vagus nerve. Gastro-intestinal tract (up to the splenic flexure) – via the terminal branches of the vagus nerve. Fig 1.2 – The three parts of the pharynx, and their borders. The laryngopharynx is innervated by the vagus nerve. The vagus nerve has a minor role in taste sensation. It carries afferent fibres from the root of the tongue and epiglottis. (This is not to be confused with the special sensation of the glossopharyngeal nerve, which provides taste sensation for the posterior 1/3 of the tongue). 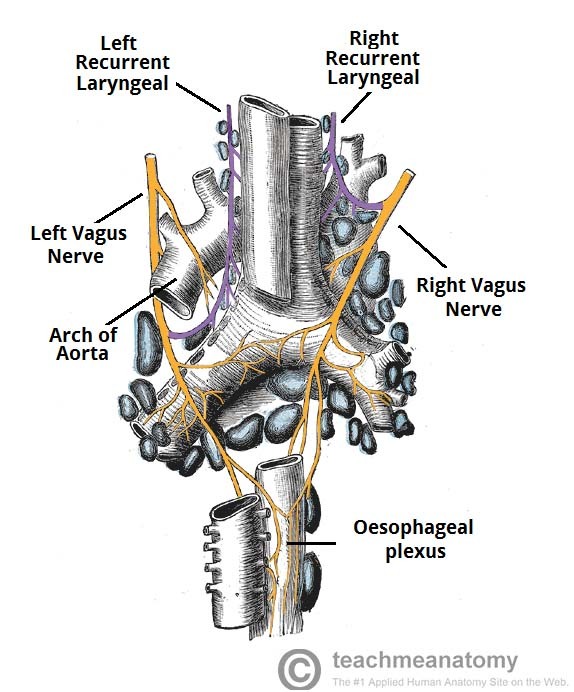 The vagus nerve innervates the majority of the muscles associated with the pharynx and larynx. 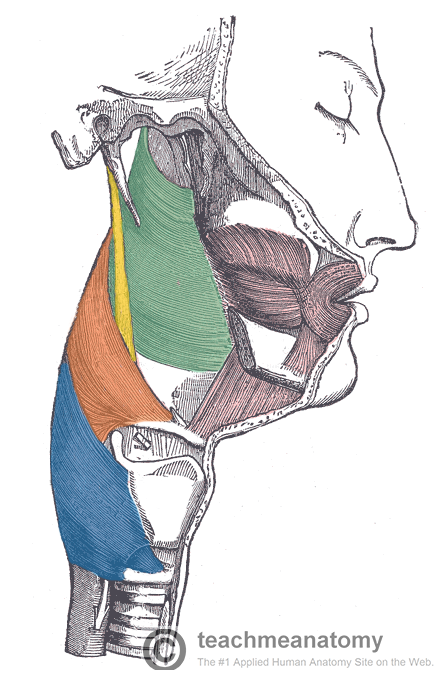 These muscles are responsible for the initiation of swallowing and phonation. An additional muscle of the pharynx, the stylopharyngeus, is innervated by the glossopharyngeal nerve. Fig 2 – Lateral view of the deep structures of the pharynx. Visible are the circular muscles of the pharynx, and the stylopharyngeus. Innervation to the intrinsic muscles of the larynx is achieved via the recurrent laryngeal nerve and external branch of the superior laryngeal nerve. In addition to the pharynx and larynx, the vagus nerve also innervates the palatoglossus of the tongue, and the majority of the muscles of the soft palate. In the thorax and abdomen, the vagus nerve is the main parasympathetic outflow to the heart and gastro-intestinal organs. Cardiac branches arise in the thorax, conveying parasympathetic innervation to the sino-atrial and atrio-ventricular nodes of the heart (For more heart anatomy, see here). These branches stimulate a reduction in the resting heart rate. They are constantly active, producing a rhythm of 60 – 80 beats per minute. If the vagus nerve was lesioned, the resting heart rate would be around 100 beats per minute. The vagus nerve provides parasympathetic innervation to the majority of the abdominal organs. It sends branches to the oesophagus, stomach and most of the intestinal tract – up to the splenic flexure of the large colon. The function of the vagus nerve is to stimulate smooth muscle contraction and glandular secretions in these organs. For example, in the stomach, the vagus nerve increases the rate of gastric emptying, and stimulates acid production. Many pharmacological agents can be used to potentiate vagal tone on the heart therefore slowing the heart rate. Beta-blockers, muscarinic agonists and cardiac glycosides such as Digoxin are just a few that can be used. Vasovagal syncope can ensue during a period of emotional stress for example causing a sudden drop in blood pressure and heart rate. Further to this a carotid massage can compress the carotid sinus leading to the perception of a high blood pressure. This will cause CN X to increase its firing leading to a decreased activity of the SA node and AV node. Overall a decreased rate and strength of contraction will ensue and the person may experience syncope. Many congenital heart defects such as a patent ductus arteriosus can irritate the left recurrent laryngeal nerve, leading to dysphonia (hoarse voice). Lesions to the CN X are rare. A lesion to the pharyngeal branches can lead to dysphagia (difficulty swallowing) due to the involvement with the muscles of the pharynx. As CN X innervates the Palatopharyngeus and Salpingopharyngeus muscles a lesion here will cause the Palatoglossal arch to drop leading to Uvula deviation away from the affected side. The CN IX is sensory to the oropharynx and laryngopharynx with CN X being the motor efferents involved in the Gag reflex therefore a lesion in this area will cause a loss of the Gag reflex. Once upon a time a vagotomy could be done to reduce excess stomach acid production. However with advancements in pharmacological therapy this is no longer necessary. As stated above a lesion to one of the RLN’s will cause dysphonia. A lesion to both RLN’s will cause aphonia (loss of voice) and a stridor (inspiratory wheeze). Paralysis of the RLN’s usually occur due to cancer of the larynx or thyroid gland or due to surgical complications. What is the main function of the recurrent laryngeal nerve? What are the functions of the vagus nerve? Below is an illustration of the muscles of the pharynx. Which structure is highlighted in blue?